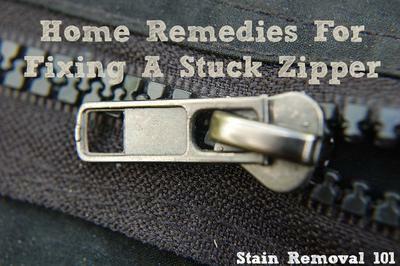 A stuck zipper can be a real nuisance and quite aggravating. 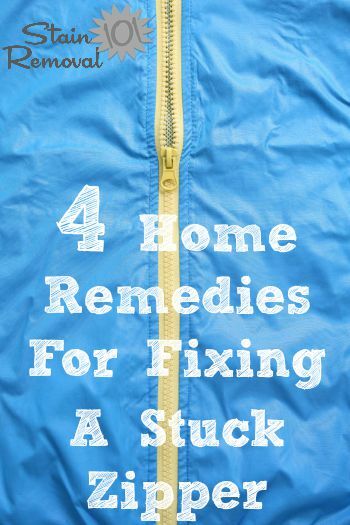 Below I've gathered four different home remedies you can use to fix one, most likely with stuff you've already got in your home. Here is a quick household remedy you can try to unstick that zipper quickly and easily - put a drop of olive oil on it. Yes, that's right. It's that easy. After you put the drop of olive oil on the zipper wipe off any excess olive oil, and then your zipper should move like it is supposed to. Extra hint - be careful when using this trick on zippers attached to cloth, because the olive oil can stain the fabric if you're not careful. That is why this tip works best with luggage or other bag zippers, which are attached to plastic or leather objects. If you do get an olive oil stain on cloth using this tip follow these olive oil stain removal tips to get rid of that stain. Do you have any other ingenious ways to use olive oil around your home besides to unstick a stuck zipper? If so, share your uses for olive oil here, or read even more tips already submitted. After I shared the tip above about olive oil I had several readers write in to say what they used instead. One of the most popular suggestions was a bar of soap. 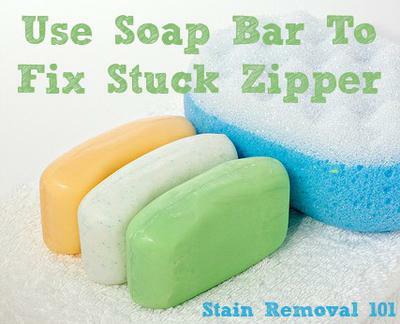 For example, Mary said, "We always rubbed a bar of soap on our stuck zippers." In addition, Denise said, "I was always told to rub teeth of zipper with a bar soap to make it slide easier." There's a lot of other household uses for bar soap here if you'd like even more ideas for using this common item in your home. Another common suggestion from readers was to use some type of wax, again because it should help make it slide more easily. Janna explained, "Household wax works better. Just run it over the inside and outside." 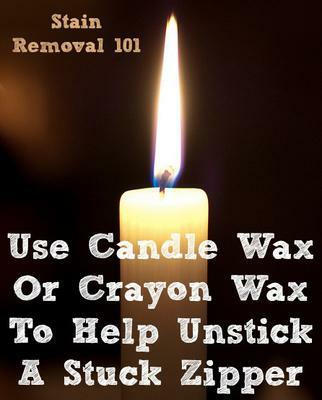 Many people used candle wax, from a cheap candle stick for example. However, there were also suggestions for crayons. I liked Patricia's suggestion, who said, "Keep the wax crayon from the Easter egg color kit," and use that. Great way to reuse an item, and those crayons are colorless so less noticeable I would think. The final popular suggestion from readers for zippers was to use a pencil lead, in much the way they also suggested rubbing other substances on the stuck teeth of the zipper. In fact, a reader, Christine, summed up all the advice by stating, "To prevent the zipper getting stuck in the first place rub with soap bar, wax (I use an old candle), or pencil lead (graphite). Works like a charm." Now, if you accidentally get marks on the item you're working on here are instructions for removing pencil marks. So, there you have it! 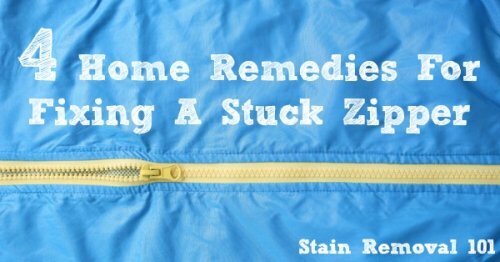 There's quite a few home remedies for fixing stuck zippers. Do you have another one? If so, I'd love to hear it. You can share your remedies and hints here and I'll add them to the page. I would worry about the olive oil staining the item. I've always used chapstick because it's easier to spread and less messy. Another way to free up a zipper is with candle wax. Just rub the unlit candle on the zipper, and wow! It's working again. No stain to worry about. 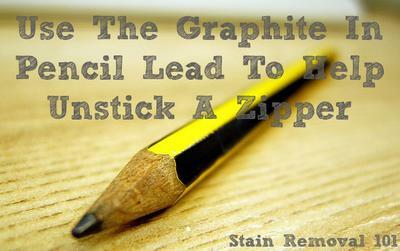 Soap, wax and pencils will not work on a nylon zipper. What then? When the tab breaks off a zipper, you can't pull the zipper up or down. Use a paper clip looped through the hole on the zipper pull. The zipper will easily open. I used need nose pliers with just a bit of force to tighten the slider & presto the zipper worked puuuuuuurrrrrrfect. This was a plastic zipper. Metal zippers are easy. What about plastic zippers?